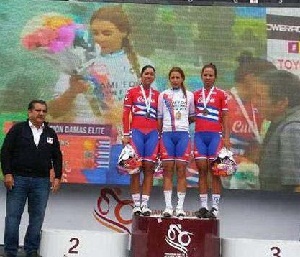 May 7 (Cubadebate) Led by Arlenis Sierra, Cuba gave a perfect performance on the last day of the Pan American Road Cycling Championships in San Juan, Argentina. Finishing the 80 kilometer race in a time of 1:58:30, the 25 year old athlete took first place on the podium, joined by teammates Iraida García and Marlies Mejías, who occupied second and third, respectively. Meanwhile Claudia Baró and Yudelmis Domínguez, one of the Cuban team’s most experienced members, came in fourth and fifth in that order, with the former winning gold in the under 23 category, reports José Luis Basulto. Although Cuba has won the road cycling competition in the past, with Sierra, world track cycling champion and Marlies Mejías both taking the top spot, this was the first time the team has achieved such a feat in a continental competition, which also saw Mailín Sánchez finish eighth. This year’s result represents good prospects for the Cuban squad as it looks toward the upcoming Central American and Caribbean Games, Barranquilla 2018, where the cycling competitions (road and track) will take place in the city of Cali.